What hidden dreams are tucked away in your heart? I have a few, and I'm sure you have one or two that haven't been realized yet. It's easy to think old dreams have died. But many dreams are God-inspired, and you need to look at them carefully before letting them go. Have you held these dreams since you were a little girl? Maybe you dreamed of being a writer. A teacher. A singer or a dancer. Do your dreams seem silly to you now, or does uncovering them spark hope in your heart? 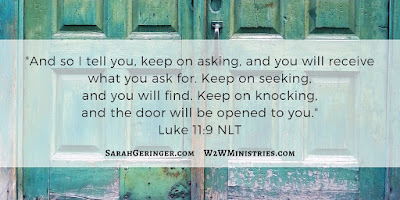 Asking, seeking and knocking require faith. They require trusting that God will provide answers, and that He has a master plan for your life. God cares about your dreams. He will help you them a reality as you ask, seek, and knock. Notice that God first tells you to ask. Pray consistently about your dream for 30 days, continuing to open yourself to God's will. Write your prayer requests in a journal, and make sure to record the answers. You will see progress if you keep asking, because the Holy Spirit will be working. Keep asking, seeking, and knocking to pursue your God-given dreams. Living in the age of internet access makes seeking easy. Research your dream and look into ways to pursue it. Perhaps you can sign up for a course, join a Facebook group, find a new job, or track down a mentor. Keep seeking by using a search engine, and you will be sure to find inspiration. It takes courage to knock on the door of your dream. Knocking is a challenge because you have to put yourself out there. It's when you're sending the email, making the phone call, or driving to the meeting. 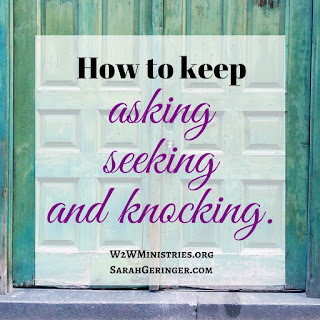 But if you've taken the time to ask and seek first, knocking won't seem as intimidating. 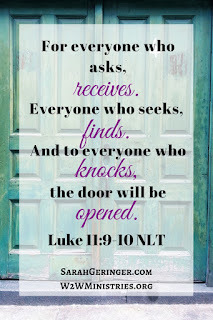 If the first door is closed, keep asking, seeking and knocking some more. God will show you how to make your dream a reality as you are persistent, obedient and accepting. An adventure awaits you...start today by asking God to help you pursue your dreams. What is your longest-held dream? What will you do this week to move forward in pursuit of your dream? Sarah, these words are so inspiring. God really does care about our dreams and it is our assignment to wait patiently until their fulfillment in his good time. Thanks for reading, Michele. Happy Friday to you! Thanks for this great reminder today! Is it really this simple?? Yes it is. Thanks for chopping off our overcomplications and getting to the truth of this process Sarah! Hi Bethany, I'm glad you enjoyed the post. Thanks for your comment! Thanks, Sarah! This is encouraging! Taking time to intentionally pray about my dreams and how God wants me to move forward is something I need to do more. Hi Lesley, I hope you find peace as you pray about pursuing your dreams. Blessings to you! Great advice! It seems logical that we would automatically ask God, doesn't it? But I know I have been guilty of NOT asking because I was afraid that he would say no. Better to ask God to shape our dreams to his will.